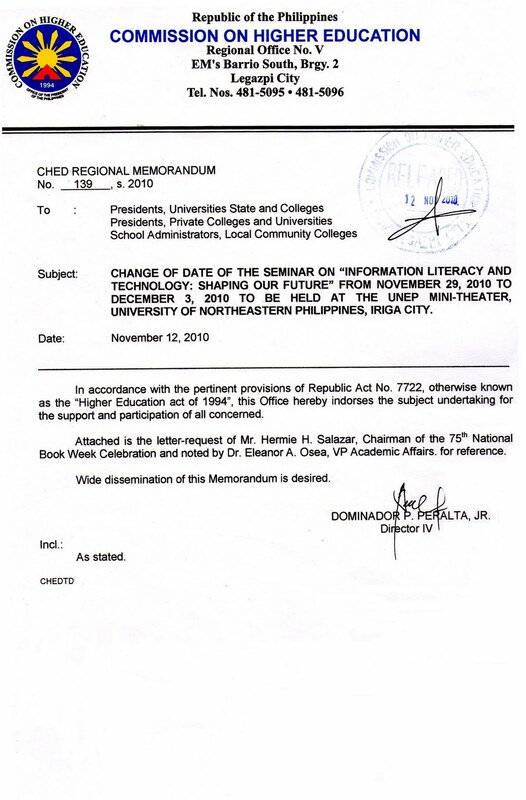 The University of Northeastern Philippines (UNEP) Library would like to invite you to a seminar/workshop on the topic “Information Literacy and Technology: Shaping Our Future” to be held at the UNEP Mini-Theater on December 03, 2010. The objective of the seminar is to create awareness of the importance of information literacy among students and to know the emerging technologies that are needed to provide better library services. Target participants are teachers, librarians and education students. A registration fee of P500.00 will be collected to cover food, token, certificate and hand outs. For inquiries and confirmation of your participation, please call us up at the above telephone numbers and/or mobile number of any of the committee members or email us. 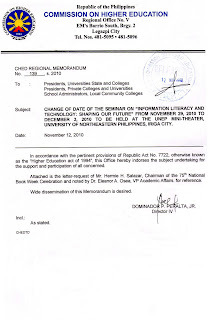 Attached are copy of the Department of Education and Commission of Higher Education Regional Memorandum, s. 2010 endorsing this activity and program of activities.